How do you feel about Plus Size Boudoir Photography? Would you do this for yourself? We talk about how this could give you a boost of confidence! Boudoir photography is a photographic style featuring sultry, intimate images taken in a bedroom, studio, or serene outdoor location. Many women envision boudoir photography as being a genre for slim “model types” but thanks to the curvy girl movement, women of all shapes and sizes are jumping on board the plus size boudoir train. Bodacious babes are experiencing increased confidence and have an extra pep in their step after seeing themselves through the lens of gifted photographers. See, boudoir photographers will accentuate your favorite body parts using strategic posing and recommend clothing and lingerie that suits your personal style. 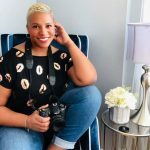 As an experienced photographer in the Washington DC region and the proud owner of Donna Lane Photography, I’d like to provide some tips to help you find the perfect plus size boudoir service! Intimate photography shoots vary in price and service and are more expensive than a typical portrait session; be prepared to pay at least $600 for your photo shoot and products. At a minimum, expect to pay a session fee which is required to book your time slot. The photographer should clearly indicate what this fee includes; a professional makeup artist, how many outfit changes are allowed and session duration. Most photographers offer a few packages that include prints, luxury photo albums, a smartphone app, wall art, and glass keepsake boxes. Boudoir photographers are abound on “deal of the day” websites but be sure to ask how much they charge for digital downloads. Many of these attractive “deals” only include 1 or 2 printed images and then charge $100 or more for digital downloads so ask questions before booking a session! I recommend at least a few photos in a quality corset because it works wonders for curves; instant hourglass figure! If you’d like something a little less restricting that provides more coverage, lace bodysuits with sleeves can be found quickly with a quick internet search. Thankfully, the beauty of boudoir is that there are no rules; if you prefer something a little more low-key, you have options. Do you have a favorite pair of jeans that instantly boost your confidence when you wear them? Bring them to your photo shoot and wear them…with little else! You can also forego outfits entirely; boudoir studios have pictures of women draped in silky white sheets for a reason; because the photos are visually stunning! Not all plus size friendly boudoir photographers are created equal! Review their work on Facebook, Instagram and their websites. Call or email with questions prior to booking. Ask for studio pictures and find out how many people will be in the studio during the shoot. Read reviews on Yelp, Facebook, and Google. Boudoir photographers tend to have a certain aesthetic; assess what theirs is. The best photographers showcase work that elevates women and promotes the female form in all its glory. Excessive overly sexualized booty shots on their IG? Skip and move on to the next contender! I can’t stress this last one enough. Life can be incredibly demanding; you work hard, meet deadlines, fulfill family obligations and juggle them all with a smile. The experience you book should be all about YOU! Get the session makeover so you can be pampered before the shoot starts. Lots of photographers include a champagne toast, fresh fruit, chocolates and other delectables because we want you to escape from the daily demands of life for a few hours. Plan your wardrobe around the pieces YOU love the most. I get it, you’ve got a sweetie who wants to see gorgeous photos of you in your pearl thong but ultimately it’s YOU who will benefit from this experience long after it’s over. Boudoir photography is a luxury investment in yourself that shouldn’t be taken lightly. Your soft skin, gorgeous curves and killer smile will be beautifully captured in a way to which no smartphone selfie can compare. The experience is a celebration of you now; not who you hope to be in 6 months to a year. Research photographers, scour IG, read reviews, book your session and then SMILE because you’re about to have the time of your life! I am a zany and outspoken UK native cozily settled in the Washington DC area. When I’m not in my studio taking pictures of phenomenal women in their knickers, I am fawning over curvy girl lingerie, the latest gadgets and Jason Momoa. Find me on Instagram, Facebook, and on Pinterest!